The iPod shuffle 2nd gen is titled as the most wearable iPod ever and the smallest MP3 player in the world, which it undoubtedly was back then. The sole 1 Gb model in an aluminum case is half the size of the previous model and the size of the Apple Remote Control. It has a built-in clip for comfortable wear. The control buttons (power\shuffle\not shuffle) are separated to avoid an accidental clicking. As for the software, the iPod shuffle 2nd gen is formatted in FAT32 and can’t support Apple Lossless playback due to low processing power. The device also lost the USB stick and the connectivity is provided via a headphone jack-USB piece of hardware to charge and load. Introduced on September 12, 2006. Later, on January 30, 2007 Apple introduced the color versions if this very iPod, yet the storage capacity – 1 Gb, 240 songs – remained the same. Dimensions: 1.62 x 1.07 x 0.41. Navigation: Four buttons on the front to navigate the playlist. The battery level indicator on the reverse. Battery Type: Lithium ion battery provides 12 hours of playback. Plug the included iPod shuffle Dock into a USB port on your computer. Put iPod shuffle in the Dock (Note: Connect the Dock to a high-power USB port to charge the battery. A USB 2.0 port is recommended. Do not use the USB port on your keyboard). The first time you connect iPod shuffle to your computer, the iPod Setup Assistant helps you configure iPod shuffle and sync it with your iTunes library. Once you’ve synced iPod shuffle with the iTunes library on a computer, a message appears whenever you connect iPod shuffle to another computer, asking if you want to sync with the iTunes library on the new computer. Click Cancel if you want to keep the current music content on iPod shuffle. Or, click Transfer Purchases to keep the contents on iPod shuffle and copy the purchased songs on it to the iTunes library on the new computer. See iTunes Help for more information. It’s important not to disconnect iPod shuffle from the computer while audio files are being loaded or when iPod shuffle is being used as an external disk. You can see if it’s OK to disconnect iPod shuffle by looking at the top of the iTunes window or by checking the iPod shuffle status light. If you see the Do not disconnect message in iTunes or if the status light on iPod shuffle is blinking orange, you must eject iPod shuffle before disconnecting it. Otherwise, you could damage files on iPod shuffle. If you enable iPod shuffle for disk use, you must always eject iPod shuffle before disconnecting it. In iTunes, click the Eject (C) button next to iPod shuffle in the Source pane. If you’re using a Mac, you can also eject iPod shuffle by dragging the iPod shuffle icon on the desktop to the Trash. If you’re using a Windows PC, you can also eject iPod shuffle by clicking the Safely Remove Hardware icon in the Windows system tray and selecting iPod shuffle. Remove iPod shuffle from the doc. Getting music from your CD collection, hard disk, or the iTunes Store (part of iTunes and available in some countries only) into the iTunes application on your computer. Organizing your music and other audio into playlists. Loading songs, audiobooks, and podcasts onto iPod shuffle. Listening to music or other audio on the go. Buy music and audiobooks or download podcasts online from the iTunes Store. Import music from audio CDs. Add music and other audio that’s already on your computer. After your music is imported and organized in iTunes, you can easily load it onto iPod shuffle. You set how music is loaded from iTunes onto iPod shuffle by connecting iPod shuffle to your computer, selecting iPod shuffle in the Source pane, and configuring options at the bottom of the Contents pane. Apple Model No: A1204 (EMC 2125). Twice in 2007 Apple launched revised modifications of the iPod shuffle 2nd gen. The revisions were those of case colors and earbuds design. Also the storage capacity was enhanced up to 2 Gb. The second generation of iPods is less susceptible to the blinking light problem, yet it remained in earlier models. The device doesn’t work with iPod accessories that require a 30-pin dock connector. Don’t throw away your old iPod shuffle, as you can sell it at iGotOffer. We buy your old devices for the highest price online: iPod shuffle for sale. 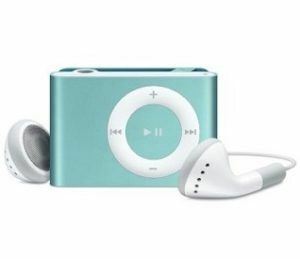 iPod color shuffle player of late 2007 are identical to the iPod color shuffle 2nd gen in everything except colors. If you are seeking for a good player, you’d just use the existing cell phones, Galaxy or iPhones or anything. Who’d need iPod Shuffle nowadays?